Two NFL Western Conference teams that were sporting surprising 2-0 records, the Baltimore Colts and Green Bay Packers, met in Milwaukee on October 8, 1955. The Colts, coached by Weeb Ewbank, had been 3-9 in ’54 but were benefiting from the play of two rookies. FB Alan “The Horse” Ameche, the Heisman Trophy winner out of Wisconsin, gained over a hundred yards in each of his first two games and QB George Shaw (pictured at right), the first overall draft choice out of Oregon, tossed touchdown passes in each as well. There was other young talent on the club interspersed among able veterans such as HB Buddy Young, DE Gino Marchetti, DT Art Donovan, and safety/PK Bert Rechichar. Green Bay was coming off of a 4-8 record under Head Coach Lisle Blackbourn the previous year. QB Tobin Rote was a good runner and, at his best, a fine passer, although he lacked consistency. End Billy Howton was an outstanding deep receiver and FB Howie Ferguson was developing into a productive runner. The defense was tough, with LB Roger Zatkoff and safety Bobby Dillon key members of the unit. There were 40,119 fans in attendance at County Stadium on a Saturday, the biggest crowd to date to see a football game there. The Packers scored quickly after Alan Ameche fumbled on the first play from scrimmage and Roger Zatkoff recovered for Green Bay at the Colts’ 38. Tobin Rote rolled to his left and fired a pass to Billy Howton, who outran three defenders for a 38-yard touchdown. Fred Cone added the extra point for the early 7-0 lead. Shortly thereafter, it was Baltimore’s turn to benefit from a turnover when Rote fumbled and DE Don Joyce fell on it at the Green Bay 12. Ameche ran for a five-yard TD and Bert Rechichar converted to tie the score. 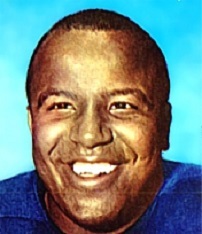 The Colts scored again when George Shaw threw to Buddy Young (pictured below), who blew past Bobby Dillon and went 82 yards for a touchdown. Rechichar again added the point after. Just before the end of the period, Shaw passed to end Jim Mutscheller for a 40-yard TD and Rechichar’s conversion gave the visitors a 21-7 lead heading into the second quarter. 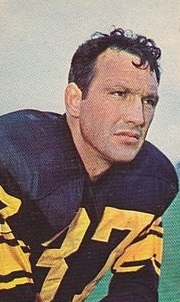 Dillon intercepted a Shaw pass in Baltimore territory and that set up an eight-play, 26-yard series that concluded with Howie Ferguson taking a pitchout and running for a touchdown from a yard out. Cone kicked the extra point to narrow the margin to 21-14 and that is how the contest remained at halftime. In the third quarter, the Packers, starting from their 38, put together a promising drive keyed by the running of Ferguson, HB Breezy Reid, and HB Veryl Switzer. After reaching the Baltimore 41, three Rote passes fell incomplete, but Cone kicked a 47-yard field goal that just made it over the crossbar. Green Bay was four points behind at 21-17. Late in the period, DHB Carl Taseff of the Colts recovered another Rote fumble on the Green Bay 21. Ameche ran the ball twice, with a carry by Shaw in between, but an aroused Packer defense kept them out of the end zone. Rechichar kicked a 10-yard field goal and Baltimore’s lead was extended to 24-17. DHB Doyle Nix intercepted a Shaw pass that was intended for Mutscheller and the Packers began to advance on offense with Rote completing throws to end Gary Knafelc and Howton. But after reaching the Baltimore 18, an offside penalty moved the home team back and they settled for a 28-yard Cone field goal to again make it a four-point game with less than five minutes on the clock. The Colts were unable to move and punted on their next series and the Packers took over again at their 40 with two minutes remaining. Rote threw to Ferguson for 11 yards and, after overthrowing Knafelc, he connected with Switzer for a first down at the Baltimore 35. Passes to Switzer and Knafelc gained eight and 16 yards, respectively, but with time slipping away, a Rote toss into the end zone was out of Howton’s reach. The Colts held on for a 24-20 win. Green Bay had more total yards (322 to 255) and first downs (17 to 8) than the Colts, and outgained the visitors both on the ground (136 to 103) and through the air (186 to 152). However, the Packers spent most of the game trying to catch up to Baltimore, who made key plays to take the early lead. The Colts turned the ball over four times, to three by Green Bay. George Shaw completed just 6 of 16 passes for 162 yards, but two of them were for touchdowns, although three were intercepted. 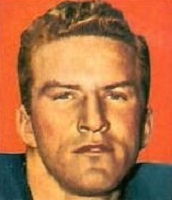 Alan Ameche was held to 63 yards on 20 carries, one of which was good for a TD. For the Packers, Tobin Rote was successful on 19 of 39 throws for 191 yards and a TD. Billy Howton caught 6 passes for 86 yards and a touchdown. Howie Ferguson (pictured at right) rushed for 71 yards on 20 attempts, thus coming out ahead of Ameche in the anticipated showdown between the two fullbacks. Reaching 3-0 proved to be the high point for Baltimore’s season. The Colts lost their next two games, beat the Packers again, and then won only once more on the way to a 5-6-1 record that placed them fourth in the Western Conference. The best years for Ewbank’s team were yet to come. Despite sweeping the season series, they also managed to finish behind the Packers, who ended up third at 6-6. George Shaw continued to show promise as he threw for 1586 yards and 10 touchdowns while giving up 19 interceptions, but that promise would go largely unfulfilled. Alan Ameche led the NFL in rushing with 961 yards and rushing TDs with nine. He was a consensus first-team All-league selection and went on to perform a key role as the team rose to back-to-back NFL Championships by the end of the decade. Tobin Rote threw for 1977 yards and a league-leading 17 TD passes (along with San Francisco’s Y.A. Tittle) and also rushed for 332 yards and five touchdowns. Billy Howton received Pro Bowl recognition as he accumulated 44 catches for 697 yards (15.8 avg.) and scored five TDs. Howie Ferguson also was named to the Pro Bowl after rushing for 859 yards on 192 carries (4.5 avg.) which placed second to Ameche.